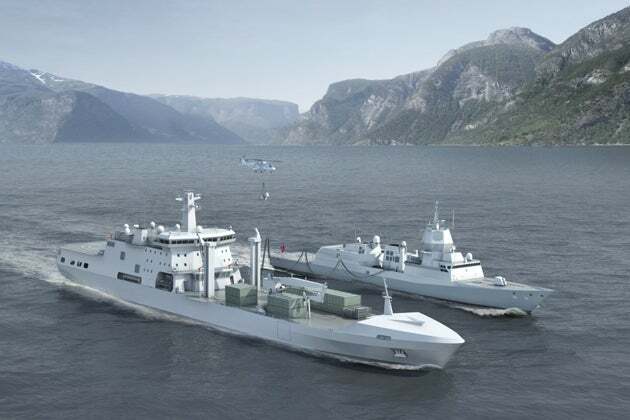 The Norwegian Defence Logistics Organisation (NDLO) has selected Aegir logistics support vessel (LSV) design from BMT Defence Services for the Royal Norwegian Navy’s joint logistics support ship (JLSS) programme. Under the £140m ($213m) contract, BMT Defence Services, supported by BMT Reliability Consultants and BMT Isis, will work with Daewoo Shipbuilding and Marine Engineering (DSME) to deliver the new logistics vessel for the Royal Norwegian Navy. Between the three companies, BMT will provide basic design, requirements analysis and acceptance planning, integrated logistics support (ILS), anagement, assessment and optimisation of the supportability. The company will also provide availability and reliability, as well as safety and environmental analysis and management. The 180m-long auxiliary vessel will have displacement of over 26,000t and beam of 26m. In April, NDLO selected DSME as the preferred supplier of the JLSS, reports Shephard Media. "The award of MARS and now LSV demonstrates BMT’s capability to work on high-profile, complex, international procurement projects." Capable of sustaining overseas operations for over 30 days, the JLSS will support Norwegian Task Force operations and will also be used to provide the Norwegian contingent for any future EU, Nato or UN mission. In 2012, BMT’s Aegir replenishment vessel design has also been selected for the UK military’s afloat reach and sustainability (MARS) tanker programme. BMT Group Defence sector director David Bright said: "The award of MARS and now LSV demonstrates BMT’s capability to work on high-profile, complex, international procurement projects." The Royal Norwegian Navy is expected to receive the vessel during October 2016 while the ship will be built by DSME at its Okpo yard, South Korea. Image: Illustration of BMT’s Aegir replenishment vessel design. Photo: courtesy of BMT Group Ltd.